On this auspicious day, our hearts bleed for the ones who fought hard to give us a 4th of July. They bleed in the colors of red, white and blue. May you have a Happy and Satisfied 4th of July. It is better to be in danger and be free, rather than to be safe and prisoned. 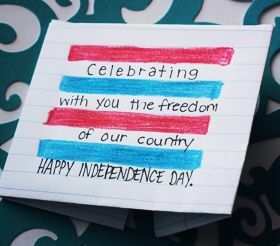 Let this day, bring us closer to the real understanding of freedom. Have a lovely 4th of July. Along with freedom also comes responsibility. Let us never forget that. Let us never take our freedom for granted. May you have a Happy 4th of July this year and for the many years to come. The flag stands there waving out to us with joy. The stars in heaven are gleaming with pride back at us. The flowers are smiling at us with delight. Everyone is celebrating for we have done them proud. Long live America! May all of you have a very Happy 4th of July. Almost all of us live in sovereign nations. Independence Day is of significant national importance as it marks the date when our nation attained freedom. Independence Day messages throng our inbox every year as we celebrate our Independence Day. Most Independence Day messages are inspiring and patriotic in nature. People broadcast such messages as a mark of respect to the martyrs who sacrificed their lives for our nation. It is so important to make the younger generations realize the importance of living in a sovereign state. Independence Day messages often serve this purpose and strikes a jingoistic chord in every recipient's heart. Independence Day messages not only commemorate the independence of a nation from a foreign rule but also ignite the fire of patriotism in the young minds of a nation. On another note, as much as we talk and hear about world peace, it cannot be denied that Independence is the basic right of every nation and its inhabitants.